sarahkatebranine: The Fauxtography Project, part five: Places to Go, Things to Do . The Fauxtography Project, part five: Places to Go, Things to Do . I've gotten a tad sloppy throughout the course of this Fauxtography project and I want to thank you for still reading through them! Last month's post was a week late and many of the pictures in this post are edited. Those confessions aside, I am enjoying the process of this project: thinking through areas in my life that are in need of change. 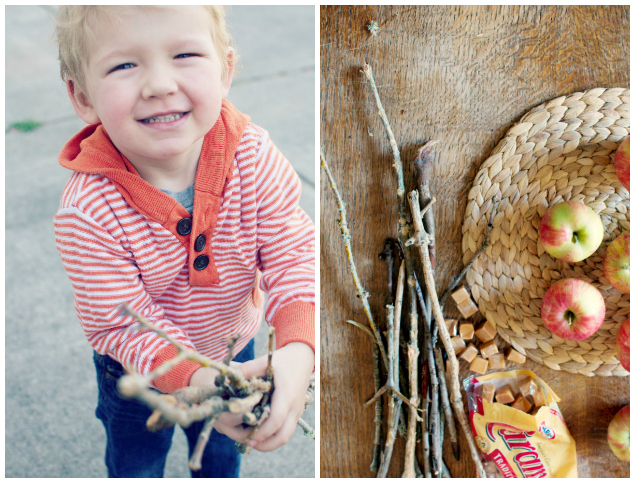 Today's post is all about ideas for crafts and hands-on projects with young children. I hope that you'll share your favorite sources and past experiences because all suggestions are very welcome here! 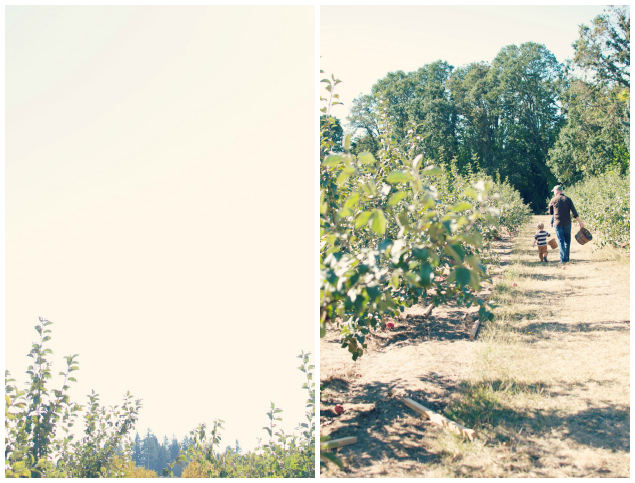 Last weekend, we took the boys on their very first apple picking adventure. Graeme had a marvelous time and Jobie dozed in the Ergo, popping up every now and then to flash us lazy smiles. I had spotted the new Martha Stewart magazine in the grocery a few days prior to our big apple picking adventure and knew that a caramel apple assembly project was going on the top of our to-do list. 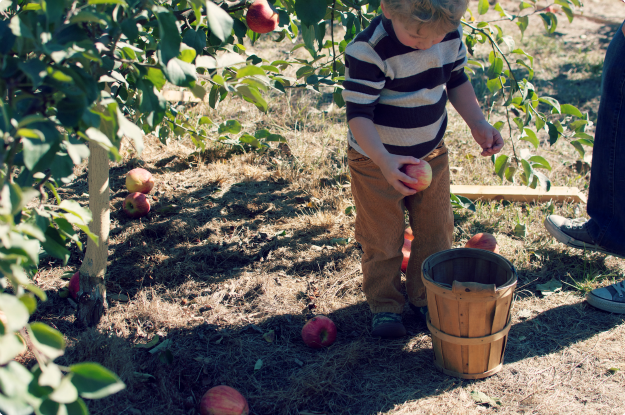 The next morning, I sent Graeme out to pick sticks for our caramel apples. He was quite proud of his finds. ( smile ) And, goodness, he looks so grown up to me, in the picture of him holding the sticks. Graeme was a bit disappointed when his kid-friendly scissors wouldn't cut through the sticks, but other than that, I think he enjoyed this little project very much, especially the eating part! Here in the pacific northwest, we are getting ready to embrace the rainy season. I have mixed emotions about this time of year. I love the cozy, get-a-cup-of-chai, read on the couch aspects of our rainy season, but I do not love the cooped-up-with-no-sun part. I am so very grateful to have a vehicle this time around. You know, that really nice Volvo that I still have yet to name! This is the first winter that I will be able to just jump in the car with the boys whenever we feel a burst of cabin fever coming on! But, getting back to the point of this post-- I really need to sit down and plan out some projects for the next few months. Jobie still takes a long morning nap, giving me quality time with just my Graeme-bear. I am so excited to do several Fall and Christmas-ish crafts with Graeme. What are your favorite Fall + Winter crafts? What are your favorite sources for activities with young ones? 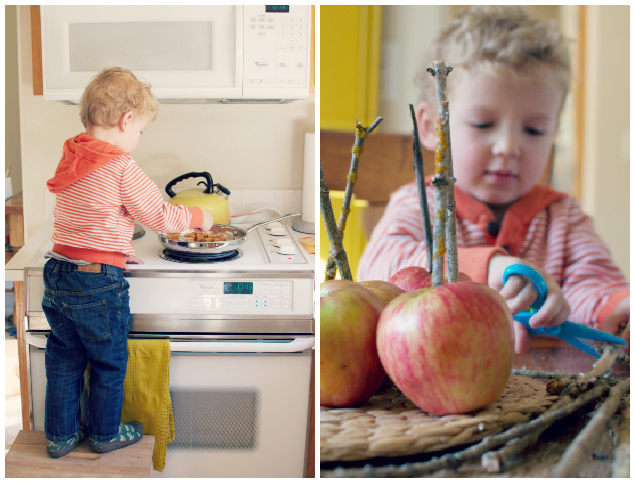 How do you keep your little ones entertained on the long, rainy days? Graeme's caramel apples were a smashing success-- aside from the fact that his mama forgot to butter the wax paper, ha! Over the next couple of weeks, we hope to make it to the pumpkin patch. Any special traditions or projects along the pumpkin lines you'd like to share? I'd love to hear your ideas. Thank you so much for reading here. I hope you and yours are well. As I write this, I have two little boys under the weather. I'm always especially concerned for my Graeme-bear as the doctors have told us that his system takes a cold harsher than most others do. Lots of hugs, kisses, and Busytown Mysteries happening around here today! 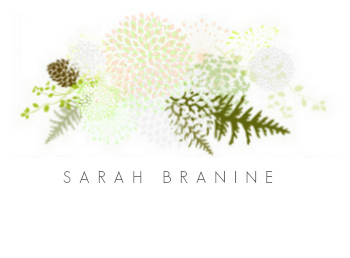 I have to tell you, Sarah, that every time I see a new post of yours come up in my Reader, I drop everything to read. Beautiful photos -- always love the window into your days. 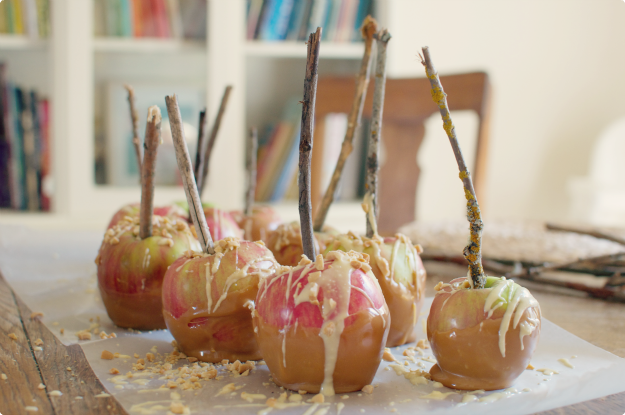 And PS love love that you made caramel apples with Graeme! Oh, so sad the boys are sick :( Wes has a cold and his colds always worry us a little too because he wheezes and has trouble breathing. the apples look so delish! They've been on my list of things to do with my G! 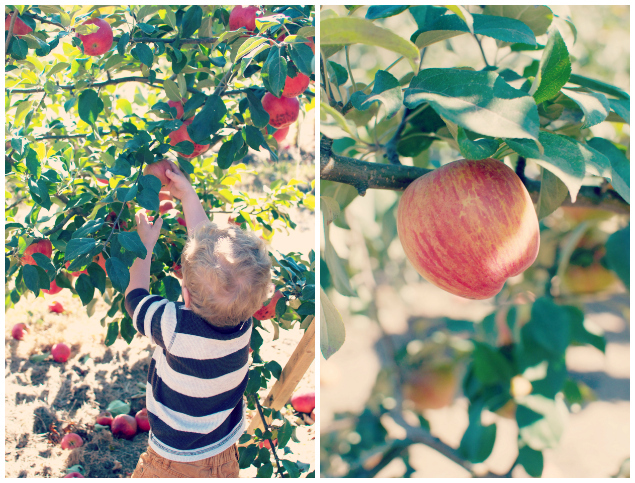 We hit the pumpking patch & apple orchard in one trip - one our favorite fall traditions! I'm thinking of organizing a busy bag swap for a momtourage playdate - we might need those in the coming months. :)So sorry to hear about G being sick - hope it passes quickly. We need to skype again soon! Those apples look sooo scrumptious!! This is going to be such a fun fall for you with those sweet boys. Enjoy! Kelly, you are so brave, girl! We thought about hitting both in one day, but didn't think we would make it. Maybe next year, when Job is walking, we'll attempt it. Oh my word! Yes, Skype date soon-- I! am! so! happy! for! you! guys! thank you, friend! You too! That sweet girl of yours will enjoy this season so much!